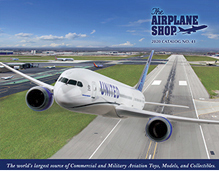 The Airplane Shop model airplane catalog is the world's most relied upon in-flight connection for high-quality models, from commercial resin and plastic airplane models to diecast military model aircrafts and more. Enter the coupon code - CATALOG20 - at checkout on The Airplane Shop website. The Airplane Shop catalog - Aviation lovers will be flying high when they reach their final shopping destination for premium model aircrafts. The Airplane Shop model airplane catalog has assembled the finest, most extensive selection of scale airplane models, serving collectors who are fans of commercial planes, military planes, spacecrafts, plastic or diecast airplanes with a model selection that caters to aircraft enthusiasts who are both young or old. Commercial model airplanes - Whether you've flown the friendly skies with American Airlines, Delta, TWA or United Airlines, The Airplane Shop features your favorite display model replicas waiting on the tarmac, ready to order. Explore the Executive Series introducing beautifully detailed, hand-carved models or choose a snap together plastic airplane model from SkyMarks that will inspire fond memories of your favorite journeys in the sky. Military model airplanes - If you're an avid collector of military aircrafts, The Airplane Shop offers military plane models from a vast assortment of brands including Corgi, Herpa, GeminiJets and more popular brands that feature perfectly scaled, highly detailed and authentically decorated diecast model airplanes and plastic construction models that are made specifically for collectors, by collectors. Toy airplanes and accessories - The Airplane Shop's airplane catalog doesn't leave out the tot-sized frequent flyers. Find a variety of fun flying toys for younger pilots including plane sets, flight attendant dolls, inflatable airplanes, pull along planes, jigsaw puzzles, plush planes, radio controlled aircrafts and more. You'll also find an assortment of airplane collectibles and accessories from pens, mugs and magnets to aviation signs, posters, videos and apparel. The Airplane Shop is your final destination for plastic and diecast model airplanes, collectibles, toy airplanes and aviation themed gifts. Browse their model airplane catalog for hundreds of model replicas and displays of both commercial and military airplanes that are exquisitely made and ideal for showing off your love for everything airborne.